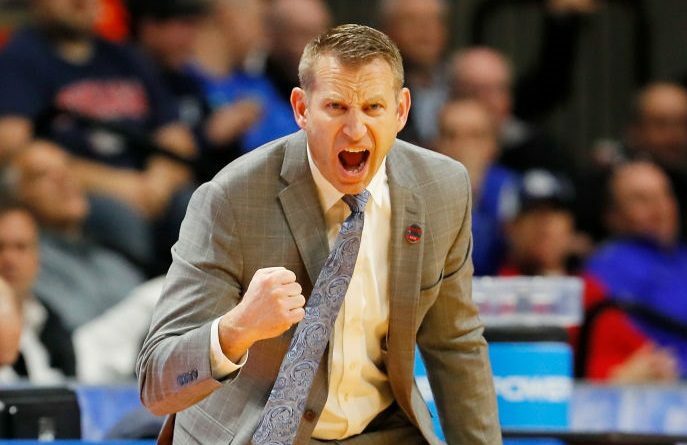 TULSA, Okla. — Nate Oats watched how Jeremy Harris attempted to fight through an offensive lull. 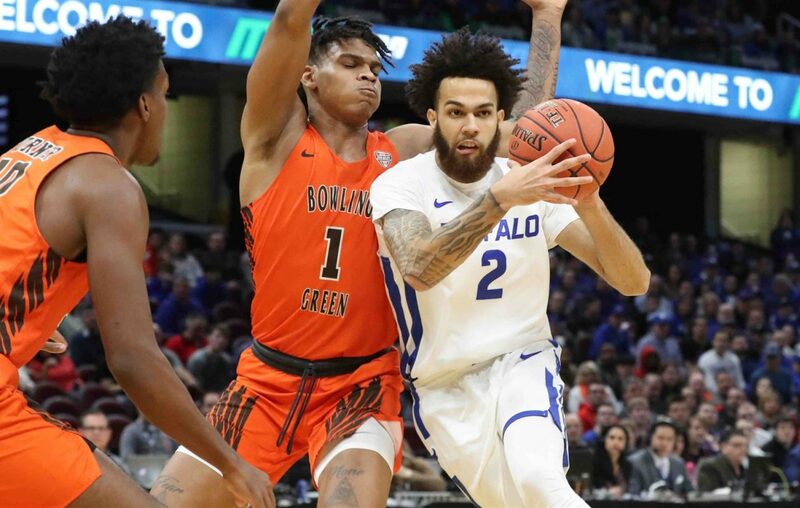 At one point this season, the senior guard on the University at Buffalo men’s basketball team, went through a stretch of 10 games in which he averaged 9.2 points per game. It was a significant drop from Harris’ pace of 14.9 points per game in the first 2 1/2 months. Oats, UB’s fourth-year coach, saw how frustrated Harris grew, and finally took him aside and led him through one-on-one workouts over the course of a week at the end of February and into March. Oats, in his typical blunt fashion, finally offered Harris some unsolicited advice, after a shoot-around the night before an 82-79 win March 5 at Ohio. "Just shoot the ball,” Oats told him. “What are you doing? Quit being passive and be aggressive." That demand came at the perfect time. As UB moved into March, Harris rediscovered his touch, and the senior guard learned to let go of the pressure he put on himself. Harris enters Sunday's NCAA Tournament second-round game as its most prolific scorer this postseason. He’s averaged 20.2 points in the last six games, including 21.8 points in the four Mid-American Conference tournament and NCAA Tournament games. The sixth-seeded Bulls (32-3) face third-seeded Texas Tech (27-6) at 6:10 p.m. at BOK Center. The winner advances to the Sweet 16, where it will face second-seeded Michigan on Thursday at the Honda Center in Anaheim, Calif.
At this point in the season, Harris isn't overthinking. 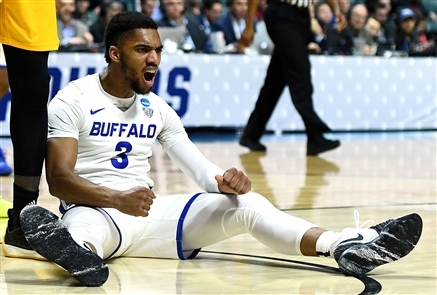 Much as he was last year, Harris has become UB's "Mr. March," as Oats calls him. Who's up next at UB? Potential replacements for Oats. Texas Tech coach Chris Beard tried to recruit Harris, a native of Greensboro, N.C., out of Gulf Coast Community College in Panama City Beach, Fla., where he averaged 18.7 points per game as a sophomore and 13.7 as a freshman. It’s part of Oats’ recruiting philosophy of replenishing its roster with players from the junior college ranks. UB signed three junior college players last fall. While most junior college products only have two years of eligibility, they also have matured in an environment that requires them to be self-sufficient academically and athletically, and one that’s much less glamorous than a Division I program. “I’m a former junior college coach, so how Buffalo has used junior college players to make this run and build this program has been very, very impressive,” said Beard, who coached at Fort Scott (Kan.) Community College and Seminole (Okla.) State College from 1999 to 2001. “I see those guys out on the road on the circuit and always congratulate them when they sign good players. They had a great team last year and even better this year. Harris followed up his first season at UB by averaging 14.9 points and 6.2 rebounds in UB’s first 19 games, including a 34-point game in a 110-80 win Jan. 8 against Toledo. “Because he shot too much,” Oats said after the win against Toledo. But in that 10-game stretch when shots simply weren’t falling, Harris found himself thinking a little too much about what he was doing wrong and not what he needed to emphasize. But he knew he had to work through that dry spell. “I was practicing,” said Harris, who shot 33.9 percent during those 10 games. “I was shooting a lot. I was making a lot of my shots in practice, but those weren’t going in, in a game. Harris’ tear began right after that conversation with Oats in Athens, Ohio. He scored 20 points March 5 against the Bobcats, the first of six consecutive games he’s scored in double figures. He scored 31 points in the Bulls’ 87-73 win against Bowling Green in the MAC tournament championship game. Six days later, he scored 21 and had 10 points in the Bulls’ 91-74 win Friday in the first round against 11th-seeded Arizona State. He did the same thing last year during the Bulls’ run through the MAC tournament and its two NCAA Tournament games. He averaged 18.4 points and seven rebounds, including 23 points and seven rebounds in a first-round upset of Arizona. UB guard Dontay Caruthers, who is rooming with Harris during the Bulls’ stay in Tulsa, says that if anything has changed about Harris in such a short span this year, it’s been Harris’ approach. And that change hasn’t been extreme.